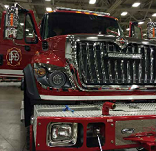 With more than 9,200 attendees over four days in August, the Fire Rescue International Conference and Expo held by the International Association of Fire Chiefs is one of the largest events for the fire sector in the US. This year FRI was held in Dallas, Texas. The Kay Bailey Hutchison Convention Centre is an enormous event hall and is named after the former US Republican Senator for Texas. Its fierce air conditioning provides a welcome respite from the searing heat of Dallas in August. This was the first time I had been to a conference where I was guided by an app on my iPhone. The FRI app was a great way to get to grips with the extensive education programme and orient myself around the large spaces of the convention centre. The IAFC organisers told me that it was the first time they had used this approach and that they were pleased that the app had been downloaded more than 2,600 times. So what is the IAFC all about? I spoke to 2013-14 President, Chief William R Metcalf, about the IAFC and its role in the fire sector in the US. He explained that the IAFC was one of the oldest professional associations in the US “born out of a need for advocacy”. Since 1873, the IAFC has provided a forum for fire and emergency service leaders to exchange ideas, develop professionally and uncover the latest products and services available to first responders. Current membership stands at around 10,000 with the vast majority drawn from North America. I asked Chief Metcalf why the FRI education programme was so light on fire prevention. He said that in the US there was a “wild west culture” and an on-going tension between individual and collective rights, so for the IAFC to influence fire department policy and interests there were “significant hurdles to overcome”. He went on to say that it was a “tough thing to do, to get fire prevention on to the agenda”. Although he accepted that the IAFC had to take the lead in changing the culture to be more focused on fire prevention, he warned that “it was a long and difficult process”. I did not get the impression that Chief Metcalf was in the vanguard of fire prevention. I also met Rhoda Mae Kerr, who will be IAFC President in 2015/16. She is a striking, tall Texas woman, one of only five female chiefs to head up a 1,000 plus fire department in the US. In a gallery of 50-something white men, Kerr provides some much welcome diversity to the IAFC. She says she is “extremely excited to be next President and proud to be the first woman”, although added that this is not the first time she has been the first woman in a Fire Service role, and she hoped her achievement would open the door for other women to follow. The education track of FRI included a vast range of topics under eight broad headings. Each session lasted 90 minutes and while it was possible to move from one to another to get a broad flavour of the topics in hand, the sheer size of the convention centre did not lend itself to seeing more than two at a time. I sat in on sessions that had just a handful of attendees and some where the hall was packed with over 100. Topics were as diverse as ‘Mentoring on Mars. and Venus’ and the consideration of the impact of legalised marijuana on the Fire Service. One of the education themes was particularly intriguing: ‘wicked problems’. This term is usually applied to cultural or social problems that are too difficult to solve. In much of the literature on this subject poverty is a common example of a wicked problem. Here in Dallas the problems are rather less intractable. I sat in on a session focused on homophobia and transphobia, which billed itself as confronting the last taboo. Jona Olsson is a charismatic woman who holds her mostly male audience with her direct but likeable style. She tells us that in 29 of the 50 US States the law allows an employer to fire someone because of their sexual orientation. She shares stories of firefighters who have suffered from homophobia and the dependence on sexual stereotypes that shore up the prejudice of their co-workers. In this small group session the level of discomfort is writ large when attendees struggled with terminology – so when Jona talked about how homophobia affects hiring and promoting, it is clear there is a long way to go to solve this wicked problem. It was good to see some British speakers on the education programme. Whilst the IAFC is ostensibly international, there were actually few non North American speakers, although the organisers tell me that attendees came from as far away as Australia, Saudi Arabia and Japan. CFO Mark Jones from Buckinghamshire Fire and Rescue Service was there to share his experience of the politics of running a fire service in the UK. He provided a candid view on his world and was a popular speaker drawing an audience numbering over 100. The ex CFO of Kent Fire and Rescue Service was also there. Charlie Hendry is now working on a wide range of topics in his new consultancy life. He spends much of his time providing mentoring and leadership training to non-fire organisations. But in Dallas, he was talking about his latest joint venture with his firm, Alchemy and US data giant, ESRI. Together they are working with US fire departments of varying size to encourage adoption of community risk reduction (that is community fire safety to you and me). Given how far behind the US is in terms of community fire safety as we know it in the UK, the work Charlie is doing is challenging fire departments to undergo transformational change and to make a commitment to introduce the concepts of fire prevention and make them work. Underpinning all of this is data. Getting data analysts to work side by side with senior decision makers in fire departments is key to the success of this programme. This work is on-going and it will take time to know if these departments will make the changes necessary to include community fire safety as a fundamental part of their work. Judging by the interest of other fire departments at FRI to get involved in a future roll out of this approach, it looks like this is just the start of a long term process of change in the US in this area. The Expo was a key draw for attendees at FRI. The Expo hall was enormous. It was filled with equipment suppliers, services and organisations keen to make contacts, sales and be seen by those decision makers across the US. I spoke to many company representatives who said that FRI is a key event for them in terms of getting their product out there and seen by such a large number of fire departments. There may have been nearly 800 suppliers there but it was hard not to be distracted by the shiny fire trucks which dominated the Expo hall. In the US, everything is bigger including the appliances and the Dallas Fire Department was out in force with much of its equipment on display. I did wonder if they had enough equipment still on the run to respond to fire calls. Armed with my iPhone app and more old fashioned paper map, I explored the expo hall looking for new and interesting technologies and equipment. I spoke to a rep from the National Directory of Public Safety Answering Points. The printed directory is a door stop of a publication containing the names and contact details for staff in all the fire departments in the US. Keeping that up to date is a Sisyphean task that is for sure. I came across a one storey blow up fire safety house: a bouncy castle style house where there would be no bouncing but a simple way to get across home fire safety messages. I was not entirely convinced about that one. The house theme continued with Modeltech International which sells portable hazard houses. These are three feet tall, 3D cross section models of multiple level homes that are managed through a remote control to demonstrate all the fire safety and CO hazards in the home. I used one of these hazard houses with the FDNY last year at a fire safety morning focused on young people with hearing impairments. The young people responded incredibly well to the visual representation of fire safety hazards in the home. Admittedly the hazard houses are heavy but they have been designed to be portable and the larger ones come with wheels. The company representative said they had little presence in the UK, but it would certainly worth a look online to see what they are offering. Away from the suppliers, at the far end of the Expo hall, a very excited and loud audience was watching the Firefighter Throwdown. In its second year, Firefighter Throwdown is a competition to allow fit, enthusiastic and competitive firefighters the opportunity to compete on a national level. One hundred athletes are chosen and compete in four different sets of challenges. It is a kind of Crossfit style competition testing strength and endurance. The firefighters I watched were deadlifting 235lb and more. It was oddly compelling, but exhausting just to watch. And on a lighter note, on the final night, all attendees were invited to the FRI Street Party. Luckily no streets were involved, just a large, dark and thankfully air conditioned hall with barbecued food; plenty of Texas Shiner Beer on tap and replete with rodeo cow simulator for the fearless to try their luck. Texans are known for their hospitality and the Dallas Fire Department was a fine host, but I just could not work out how the firefighters who were standing around outside in the 38 degree heat could look quite so cool. And they were not even wearing stetsons.